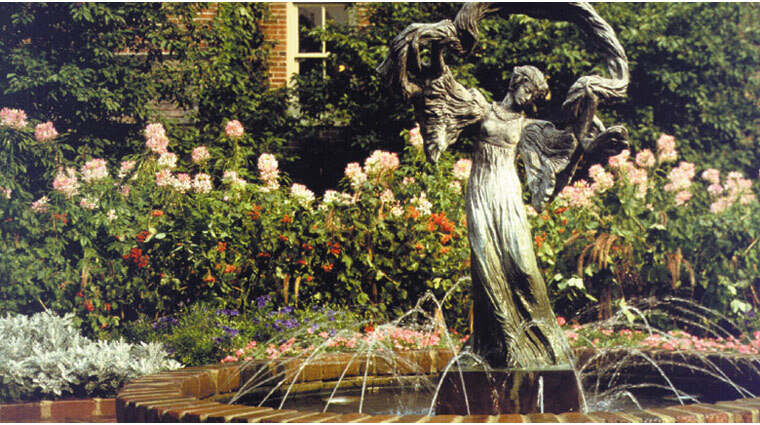 The American Club is a historic Five-Star hotel located on the grounds of the Kohler campus, one hour north of Milwaukee and 2.5 hours north of downtown Chicago. Housed in an English Tudor-style structure that was once a dormitory for the workers who fueled Kohler's growth as a bath supply company at the turn of the 20th century, the space has been lavishly updated to provide a comfortable country retreat with rooms featuring decor that is a nod to the hotel's past, and updated bathrooms loaded with top-of-the-line Kohler products. Outside of the small but charming rooms, there's plenty to experience, from the ice cream parlor housed in the historic greenhouse to the four other charming restaurants, which serve everything from pub fare to haute cuisine. The luxury Wisconsin property welcomes families with fun kid’s amenities like toys, baseball caps and other goodies, plus free meals and bike rentals. The entire family also gets a free pass to the Sports Core, where there’s an indoor pool. With some of the most scenic and sought-after courses in the country, The American Club’s golf offerings are not to be missed. The jewel in the resort’s crown is Whistling Straits Golf Course, which hosted the 2015 PGA Championship. The Kohler Water Spa is not to be missed offering high-end, high-tech and custom-designed Kohler baths and showers that are the settings for unique treatments like the lavender rain exfoliation, the H20 inspiration exfoliation and an acoustic bath. Given that the hotel is part of the Kohler bath empire, it’s no surprise that the bathrooms here are a standout feature. 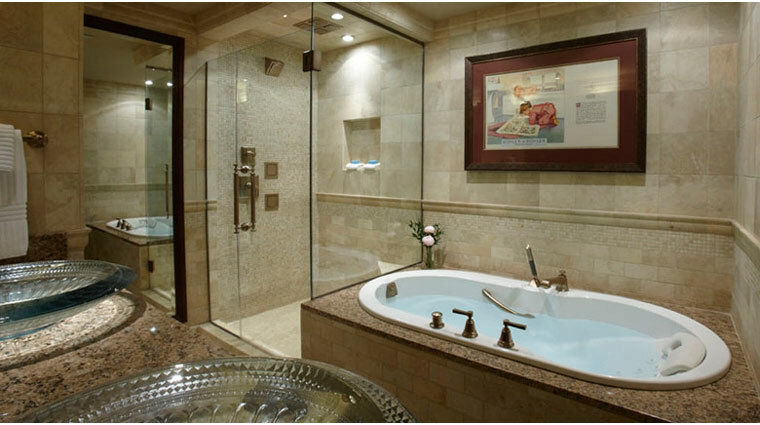 Even regular rooms feature stylish tile work and inviting massage-jet shower heads. Chef Matthew Bauer at The Immigrant Restaurant is continually developing his menu to offer new seasonal, locally sourced pleasures. We love the restaurant’s cozy underground setting and appreciate the excellent wine list. 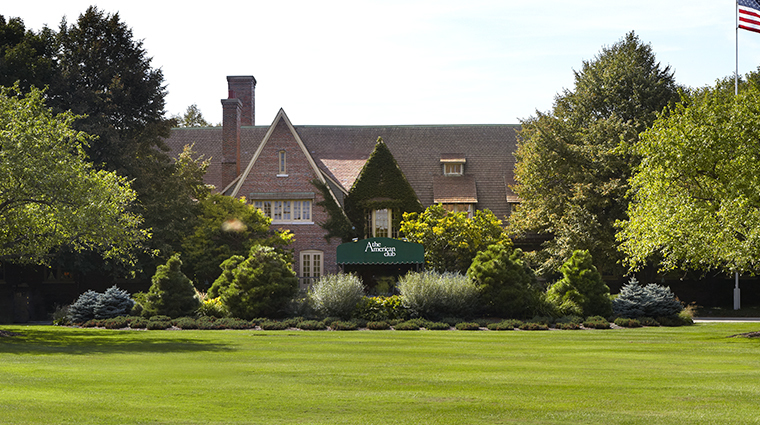 Children are welcome at the resort and in the main building, but the entire building which houses the spa, known as the Carriage House, has a no-kids policy. The American Club is a tucked-away resort, so you won’t find the tech perks here that you might at larger, more urban hotels. The property does offer wi-fi and DVD players can be rented from the front desk, but a gadget-free getaway is highly recommended at this hotel. The American Club used to be the Kohler workers’ dorm and, today, it’s on the National Register of Historic Places. It’s kept up to date but its village charm is part of its appeal. The rooms at the Five-Star hotel vary by type, but even the standard room provides a luxurious experience with furnishings from Baker or McGuire, a refreshment center and showy Kohler bathrooms. 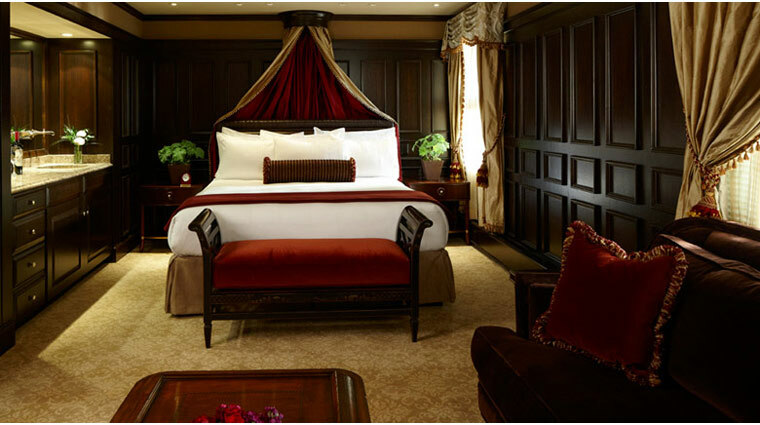 There are 86 standard and 67 deluxe quarters, and every room possesses its own unique décor, providing guests a new and different experience during every return visit to the hotel. 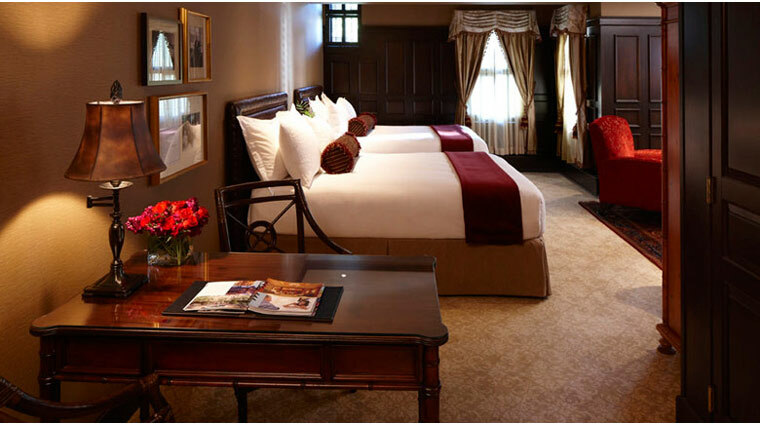 Deluxe, superior and heritage rooms offer space varying between 333 and 542 square feet. They also include cozy seating areas for unwinding at the end of the day. Every room contains a touch of nature with a live Canadian hemlock that was grown specifically for the luxury hotel. Every unit in the main building is also dedicated to a historical figure, with artwork to honor that person. The resort’s showcase restaurant is the Immigrant Restaurant, which offers fine dining with an emphasis on local and artisanal ingredient under the direction of chef Matthew Bauer. The chef’s signature dish is the ancho chile and coffee-braised beef short ribs. Ask your server at The Immigrant Restaurant for dessert advice and chances are you’ll end up the hazelnut mousseline crunch tower. With its butter ice cream and sweet, salty tuile cookie, the restaurant’s signature dessert is a can’t-miss finish to any meal. The casual, family-friendly Horse & Plow tavern offers pub fare with a notable beer list. Be sure to try the Jigger Ale, it is custom brewed for the American Club’s sister property in St. Andrews, Scotland and is only one of two places in the world where you can get it. In the Wisconsin hotel’s courtyard, the Greenhouse Cage offers light lunch, coffee, snacks and house made ice cream. The Wisconsin Room, open for breakfast and dinner, is additionally known for its Friday night seafood buffet and extravagant Sunday brunch. Go tropical with Hawaiian barbecued mahi-mahi or grab some garlic seared scallops hot out of the pan at the chef’s station.